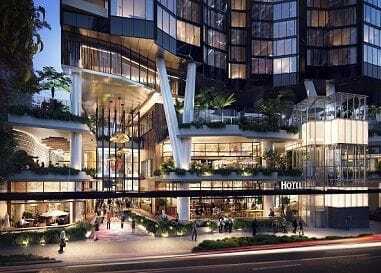 BRISBANE City Council has given the green light to a $325 million luxury five-star hotel and apartment tower which will see the renaissance of a landmark site in the heart of the CBD. Developer Mary 111 Pty Ltd, associated with local businessman Sam Chong, will fuse a five-star international hotel with executive residences in a format popular around the world but not seen before in Brisbane. The concept has already proved successful on the Gold Coast where Brookfield Multiplex developed the $700 million Hilton Surfers Paradise Hotel and Residences, which comprises 169 hotel rooms and 224 luxury apartments. The approval granted to Mary Lane in Brisbane is for 286 hotel rooms and 167 residences, although the developer has since lodged an amendment which will retain the current building form but bring the number of residences to 184. The developer will retain control of the building's 400sqm retail element which will include a café, restaurants and bar. Development manager Ian Pert, of GMP Management, describes Mary Lane as a unique offering in the Australian market that combines an executive residential offering atop a five-star hotel. "The combination of a five-star hotel, luxury residences and dining precinct is popular in cities such as Singapore, Hong Kong and New York but until now has not been seen in Australia on this scale," he said. "There is no peer in Australia for a project of this type and it's going to add a new dimension to the living experience in Brisbane's CBD. "The design of the building takes its cues from cosmopolitan cities around the world." Pert says a large part of the design brief involved activating the frontage to Mary Street to attract people and create a destination in its own right. Construction of the tower is set to begin in early 2016 and an agreement with an international hotel operator is in its final stages. Chong, who is based in Brisbane, also owns the neighbouring Four Points by Sheraton and has significant interests in the resources and property sectors. The project has been designed by Woods Bagot and residences will be marketed by Colliers International. Mary Lane will comprise a mix of one, two and three-bedroom residences as well as a limited number of penthouses. The design incorporates separate facilities for residents and guests. Resident facilities include a level 37 rooftop recreation deck with pool, gymnasium, barbecue and function areas. The hotel element includes four podium levels with a large, resort style pool with swim up bar, gymnasium, day spa, function space, lobby bar and restaurant.